Chronic wasting disease disrupts the world of people who care about deer. This disruption begins with regulations to determine where the disease is located, prevent its spread, and sometimes to try to eradicate it before it gains a foothold. Over the long term, CWD can cause change by decreasing annual survival, thereby reducing the number of deer that can be harvested and eventually lowering deer density. Change is unpleasant and people respond to it in different ways. Some recognize the problem and act to address it. Others are less open to the change and strive to maintain the world the way it was. There is a campaign, arising from fear of the change caused by CWD, to marginalize CWD as a management issue. The campaign has been intense, occurring in presentations, lay publications, and the internet. Tellingly, the central ideas behind this campaign have never appeared in a publication subject to scientific peer-review, and in fact, are in direct contrast to the recommendations of the majority of wildlife veterinarians and epidemiologists(1). Although CWD has been a topic of intense discussion for several years, we constantly field questions from concerned land stewards about the disease. This article provides a counterweight to things you may have heard about CWD from those who feel CWD is of no significance. Following are 7 statements you may have heard about CWD and reasons why these statements are misleading at best and absolutely false at worst. 1) CWD is not a disease. FALSE. Because CWD does not have obvious and immediate impacts and because it is not caused by a typical disease agent, such as a virus or bacterium, some suggest that CWD is not a disease, but simply a condition or a syndrome. It is important to note that CWD is fatal, is caused by a disease agent, can be spread from infected animals to healthy animals, and causes holes to form in the animal’s brain, resulting in the animal progressively losing its ability to avoid danger, eat food, and walk or function normally. CWD is clearly a disease and is listed as a disease by the Centers for Disease Control and Prevention(2). 2) CWD is not a common disease in the United States. TRUE, but misleading. People not concerned about CWD state that 97% of the 1.17 million deer and elk tested in 14 years tested negative for CWD and CWD has been detected in only 4% of counties in the United States. These facts are not disputed but their implication is disputed on 2 accounts. First, CWD is not common in the United States but neither is meningococcal disease (human disease with 1.2 cases/1 million people). However, rarity does not mean unimportant. Just as human health officials act quickly when meningitis is detected in the United States, so too should wildlife managers do everything they can to keep from having CWD become established in their deer herds. In fact, CWD differs from meningococcal disease in some critical ways. Meningitis outbreaks can be managed and the disease can be eradicated from an area. In contrast, CWD cannot be eradicated once established because the abnormal prion proteins (the disease agent) persist long-term in the environment; all indications are that the disease will be present in the environment for years (3). The best offense against CWD is a rock-solid defense to keep CWD from being introduced into a deer population. Thus, the goal of all CWD management programs is to keep the disease rare. Second, CWD is not equally prevalent across the United States, so defining the population as deer throughout North America is misleading. The disease has not been detected in most places in the United States. But, where CWD has been detected, it can have high prevalence. As might be expected, prevalence increases the longer the disease has been present in an area. Thus, some populations in the endemic areas of Colorado and Wyoming have prevalence ranging from 20 to 40% (4). 3) CWD is not spreading rapidly. FALSE. To the contrary, for a disease first detected in free-ranging deer in the 1980s with no clear vector such as an insect to spread it, CWD has spread remarkably fast (5). From an endemic area in northcentral Colorado and southeast Wyoming, the range of the disease increased over a 20-year period to the Lake States, the Midwest, New Mexico, and central Canada. By 2005, the disease was present in the central Appalachians and around 2010, the number of states in which CWD was detected grew dramatically. The disease has also been found outside of the United States, such as in South Korea and Norway. Some of the spread of the disease outside the endemic area is likely a result of natural deer and elk movements. Other occurrences are best explained by movement of CWD-positive elk or deer or their tissue. Again, the disease has spread remarkably fast given what is known about its transmission. Responsible wildlife managers should strive to keep CWD from spreading into the herds they manage. 4) CWD cannot be prevented or controlled, only monitored. FALSE. Clearly, CWD can be prevented from infecting a population. Preventing movement of infected deer and infected tissue into areas where CWD does not occur is the most powerful tool in the manager’s tool kit. Once introduced, the options decline dramatically. Managers in New York detected 2 positive wild deer in the vicinity of an infected captive deer facility in an isolated CWD outbreak in 2005. Acting swiftly, deer managers in New York harvested deer heavily in the outbreak area and CWD has not been detected in the area since. The case in New York appears unique because CWD was detected early. In most instances, the disease is well established once detected and there are no viable options for eliminating it. The rate of spread and the rate at which prevalence increases may be slowed by reducing deer density, but the effectiveness of these approaches is still unclear and, because they must be instituted for years or decades, these approaches may be opposed by groups who desire higher deer densities. 5) No peer-reviewed paper to date clearly shows a cause-and-effect relationship between recent deer declines and CWD. FALSE. This statement harkens back to the tobacco companies’ strategy of denying tobacco causes cancer and can shorten people’s lives. Cancer may have several causes and it may be difficult to conclude a given cancer is caused by tobacco use, but that does not mean tobacco is safe to use. To the contrary, the link between premature death and tobacco use is clear. Similarly, deer and elk herds may decline for many reasons, but scientists have techniques that allow them to isolate the cause of population declines. There are now 3 peer-reviewed studies demonstrating cause and effect relationships between deer declines and CWD (4). And the effects are not subtle. Population estimates were available for 2 of the populations, and those populations declined 40-50% over 10-20 years. Survival of CWD-negative deer in these studies was 30-40% greater than survival of CWD-positive deer (e.g., survival of CWD-negative deer = 85% vs. CWD-positive deer = 50%). Some deer populations have high enough reproductive rates to avoid declines, but many do not, especially in semi-arid south and western Texas (see point 7 below). 6) CWD does not kill deer. FALSE. This statement is simply not true because wild and captive deer die of clinical CWD; the disease is fatal. However, many CWD-positive deer do not die strictly from CWD, just as people positive for AIDS may not die from AIDS. Rather, AIDS-positive people often die of infections that their body could not defeat because AIDS had compromised their immune system. Similarly, deer in free-ranging populations may not die of CWD, but, as might be expected of an animal with holes in its brain, these deer are susceptible to other factors. CWD-positive deer are more vulnerable to predators, hunters, and vehicle collisions (6). 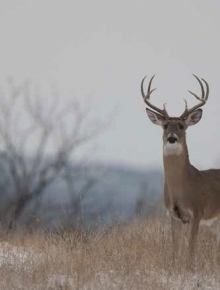 Deer with CWD may be less motivated to forage or forage less efficiently. Poor foraging ability makes these deer more susceptible to death during winter or other periods of stress. As an example of the impact of CWD on deer survival, white-tailed deer in Wyoming that were positive for CWD, even if they did not show clinical symptoms, had a 40% chance of surviving 1 year whereas deer without CWD in the same population had an 80% chance of surviving 1 year (7). These findings are especially meaningful because both the CWD-negative and CWD-positive deer were in the same area and exposed to the same threats of mortality. The only difference was that some had contracted CWD and others had not. 7) Because CWD takes 14 months to 4 years to develop and because population generation time is 3.5 years, the vast majority of deer never live long enough to be clinical to CWD. Therefore, CWD, by its clinical nature, cannot be a factor in Texas deer herd management, present or future. FALSE and misleading. This statement is rife with misunderstanding of the importance of adult survival in deer populations, especially deer populations in semi-arid rangelands of Texas. Taking South Texas as an example, about 30% of the adult deer are typically 6 years old or older in sustainably harvested deer populations. The only way for this age structure to develop is for adult survival to be high. High adult survival is critical to persistence of deer populations in South Texas because fawn:doe ratios may average 30 fawns/100 does. This level of fawn production is low and reflects the challenging nutritional environment of South Texas, especially during drought. In fact, fawn production in South Texas is just sufficient to allow the deer population to grow at a slow rate and therefore to support a light recreational harvest (8). Contrary to the suggestion that there is no problem with deer dying before they reach 4-years of age, such high adult mortality would cause deer populations in South Texas to decline rapidly. To compound the problem of CWD for deer populations in South Texas, female deer rarely raise a fawn until they are 3 years old. Even though they typically conceive for the first time as yearlings and give birth on their 2nd birthday, autumn lactation rates and maternity determined using genetic techniques show that 2-year-old females rarely raise a fawn. For this reason, high mortality before 4-years of age from CWD would be a significant problem for deer populations in South Texas and likely elsewhere in the state. Deer managers in South Texas often alleviate the constraints of low fawn production by providing supplemental feed. Supplemental feed makes a huge difference, for example by doubling fawn production and therefore removing many of the concerns described in the preceding paragraph. However, proving supplemental feed is likely to turbo-charge the spread of CWD in a deer herd. For this reason, it would be wise to cease supplemental feeding if CWD may be present. One final problem with high mortality before deer turn 4-years of age is that antler size, a characteristic of interest to many deer hunters, increases with age through at least 5 years of age and some bucks show their largest antlers at 6 or more years of age. An additional problem is that bucks also have higher prevalence of the disease than females (9). So, not only do deer populations decline with CWD but the number of mature bucks would decline even more dramatically. CWD will be a big problem for hunters who enjoy hunting trophy bucks. The mass of scientific information and expertise suggests that CWD is a disease we do not want in our deer populations. It has no positive effects and many known and potential negative impacts. In addition, the Center for Disease Control recommends that hunters not consume meat from animals that test positive for CWD (10). For all these reasons, it makes sense to take actions to keep CWD from being introduced into deer populations without the disease. Long term, we don’t want to have to deal with the ramifications of short-sighted decisions. Future generations of hunters will thank us for doing all we can to keep CWD rare. Watch the video below to learn more about TWA, and be sure to JOIN if you aren't a member of TWA!